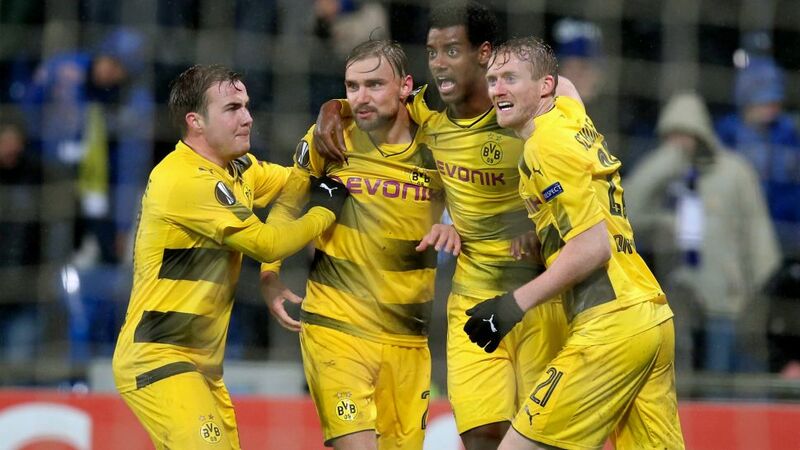 Returning Borussia Dortmund captain Marcel Schmelzer struck an 83rd-minute equaliser as the Black-and-Yellows saw off Atalanta on aggregate to reach the last 16 of the UEFA Europa League. Dortmund came into the game knowing that a draw would be enough to see them join RB Leipzig in the last 16 of the competition, but Peter Stöger's side quickly found themselves under the cosh, and Rafael Toloi put Atalanta ahead in the tie as he stabbed home following a Roman Bürki error. Bryan Cristante should have doubled the hosts' lead before the half-hour but could only head wide of the post. Mario Götze did get the ball in the back of the net for BVB but the linesman's flag was up for offside, as the visitors failed to seriously threaten Etrit Berisha's goal in an uninspiring first-half performance. Schmelzer replaced Jeremy Toljan at half-time, but it was the introduction of Marco Reus on the hour mark that finally gave Dortmund a bit of much-needed attacking thrust. Nevertheless, Atalanta had several glorious chances to double their advantage, with first-leg goalscorer Josip Ilicic dragging a shot just wide, and captain Alejandro Gomez brilliantly denied by Bürki. The hosts were made to pay for those missed opportunities as Schmelzer swept in seven minutes from time, after Berisha spilled a speculative effort from Reus. Stöger's men were far from their brilliant best in Reggio Emilia, but still did enough to secure passage to the last 16. This was the 17th time in 18 European knockout ties that Dortmund progressed after winning the first leg.BVB remain winless in their last seven European away games.Toloi and Schmelzer both scored their first goals in UEFA competition.Schmelzer grabbed his first goal for BVB since a 3-0 DFB Cup win over Sportfreunde Lotte in March 2017.Dortmund have only lost one of their 11 competitive games under Stöger, a 2-1 reverse to Bayern Munich in the DFB Cup.Dortmund reached the Europa League quarter-finals in 2015/16, losing 5-4 on aggregate to Jürgen Klopp's Liverpool.